Compare prices from multiple car hire suppliers in Funchal to find the best available deal. A few of the car rental companies we compare include Gold Car, Budget, Avis, Hertz, Sixt and many more. The city of Funchal is location in the Portuguese region of Madiera, an archipelago just located off the coast of the country. It is the largest city and the capital of the region for over five centuries. The city boasts a population of 112,015 inhabitants (2010). The city gets its name from the large quantities of fennel (funcho) that is found around the island. It is considered one of the most beautiful cities in the country. Some of the things to see while visiting Funchal include the Madeira Botanical Gardens, which houses over 2,000 plants, and the Santa Clara Covenant, which dates all the back to the fifteenth century. For some of the best in fresh fruits, vegetables, local fish, and other goods, visit the Mercado Dos Lavradores, located downtown in a historic building. Other sights to see include the Sao Lourenco Palace, and the Se Cathedral. The city is serviced by the Funchal Airport (FNC), also known as the Madeira Airport. 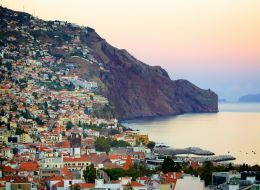 There are a few daily flights that go between some of the major cities in the country, such as Porto and Lisbon, to Funchal. The airport offers its services to a number of international and charter flights, especially during the summer months of May through October. Some of the airlines that fly to this airport include Air Berlin, EasyJet, Finnair, Iberia, Luxair, and Thomas Cook Airlines.